The Who, What, How, and Why of Stakeholders. You may know what a stakeholder is, yet some people may not be as familiar. So, we are going to set the foundation so everyone is on the same page. A Stakeholder is an individual, group, or organization, who may affect, be affected by, or perceive itself to be affected by a decision, activity, or outcome of a project. Another definition in more simpler terms for a stakeholder is a person with an interest or concern in something, especially a business. It is clear that stakeholders play a major role in the success of business as it relates to the risk factors regarding projects. In this context, stakeholders are potentially the people who are sponsoring, designing, developing, or connected to the capability you are building. 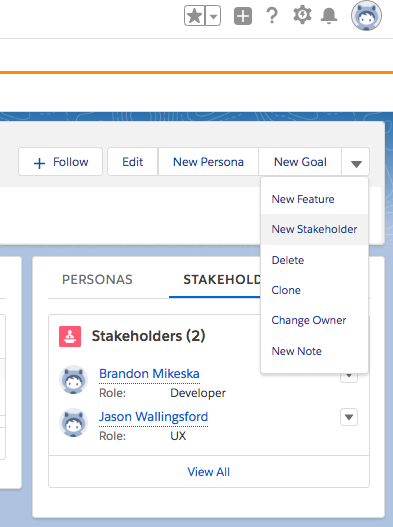 To add stakeholders, use the “New Stakeholder” at the top right of your capability. Once, you have the stakeholders related to your capability entered, the people that need to be kept in the loop will be. This will help streamline communication in your organization. How do stakeholders relate to capabilities? One reason is the gathering of transparent requirements that meet the need or solve the problem. Whether the stakeholders are external or internal, clear vision and direction of a project is determined by the involvement and commitment of the stakeholders. During complex projects that involve thousands or even millions of dollars it is vital to involve the right stakeholders that may have expertise or be subject matter experts in the area the project is being planned and implemented for. Many times during the early stages of a project the failure to involve the right stakeholders maximizes the risk of the project failing or going over budget. The wealth of knowledge from a diverse group of stakeholders will add value and build confidence among stakeholders that will assist with driving the project to the finish-line. Projects Managers do not possess the expertise in every industry or every type of project whether it be in the oil and gas sector or for software development or hardware deployment projects, which is why stakeholder involvement is critical to project delivery. A method to maximize project success and the reason why stakeholders are vital is to recognize risk as quickly as possible. One simple way to do that is to involve stakeholders immediately, which will uncover risk during project planning and the requirement gathering process. As previously mentioned stakeholders add a tremendous amount of value because the experience and expertise that is readily accessible to begin the process for mitigating the potential risk. By stakeholders being involved and assisting with requirements it maximizes the success of the project. Stakeholders are important because through their in-depth involvement they can begin the user acceptance process before change management planning even starts. Stakeholders can start conversations with peers regarding the exciting project that has started, almost complete or done. The involved stakeholders will also be aware of all the details of the project and will not be surprised with any delivered requirements regarding the project. Stakeholders' input can make or break the success of a project. Get them involved early and often to increase the likelihood that you will deliver the desired project, on-time.